The judge presiding over the case of Army private first class Bradley Manning will announce her verdict Tuesday afternoon from Ft. Meade, Maryland. Col. Denise Lind, the presiding judge in the court-martial of the United States v. Pfc Manning, said Monday morning that the long-awaited verdict will be delivered at 1 p.m. EDT from the military courthouse at the Ft. Meade Army Base outside of Baltimore. Lind has been deliberating the case since Friday afternoon when closing arguments concluded seven weeks after Manning’s court-martial got underway. She is tasked with solely deciding if the 25-year-old Army intelligence analyst is guilty of espionage, aiding the enemy and 20 other counts that could come with a maximum penalty of life in prison. Manning has admitted to sharing massive tomes of classified data with the anti-secrecy website WikiLeaks. He was arrested while deployed to Iraq in 2010 and spent more than 1,100 days in pretrial detention before the court-martial began in June. According to reports from Ft. Meade early Monday, defense attorney David Coombs expected Col. Lind to announce her verdict on Tuesday. Once Col. Lind makes her determination, the proceedings will move into the sentencing phase. There the defense is expected to call two-dozen witnesses; the prosecution is reportedly likely to call 21. 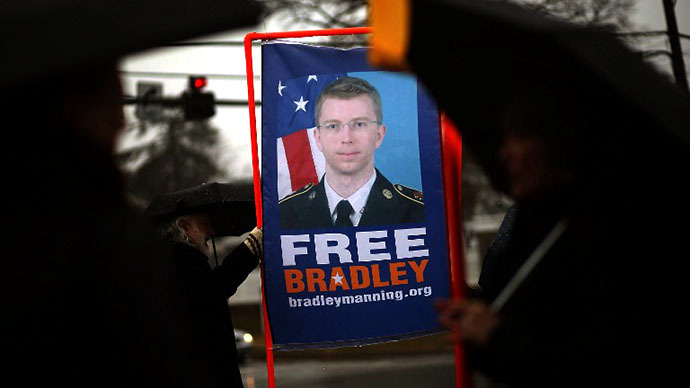 During the trial itself, the prosecution prompted testimony from more than 80 witnesses including Manning’s Army superiors and the forensics investigators who examined the hundreds of thousands of documents the soldier ripped from military computer networks. By comparison, Coombs called only 10 witnesses to speak and rested his case in under a week. The prosecution hopes they’ve convinced Lind to convict Manning of aiding the enemy, a charge they’ve accused him of because the documents the soldier sent to WikiLeaks were published openly on the Web and eventually downloaded by al-Qaeda. Coombs has called Manning a whistle-blower who wanted to expose atrocities being committed across the world in the name of the United States. Among the material Manning admitted to leaking includes field reports from the Afghan and Iraq wars, Guantanamo Bay detainee assessment briefs, and more than 250,000 diplomatic State Department cables.